Adam Lambert found himself with some down time before the Seattle sound check last night, so he decided to venture into new territory. He gave an almost-12 minute Instagram Live video, answering questions to lucky fans who were online at the moment. The rest of us just get to watch and enjoy! He also gave some short backstage videos, and they’re here too. And by the way, sorry about the headline. Some days you just don’t give two fux! This is Adam’s first Instagram Live video. He talks about Queen’s reaction to his new hair color, styling for this QAL tour, why he didn’t bring Pharoah, the creation of Two Fux, and his current intentions with his music. He keeps asking for questions. If I would have heard this live, I would have asked about the reference to OCD in Two Fux. I’ve never heard OCD mentioned with Adam. What would you have asked? Same backstage starting with The Bird, ending with makeup application. How fun for those people who were online at the time! I could sit n listen to Adam sing or talk forever. I could listen to Adam speak all night. So sweet and down to earth. It seems like fame is not changing him. That’s a good thing. Thanks for sharing Carol you are the best. Aww thanks! Everything about Adam, including this site has been so much fun. Thanks for being such a loyal contributor! just don’t care for the red hair. Personally like it Brown, or black. But I know this is show business. And I did notice a lot of the singers are doing it blond,Red,Purple. So that’s just a thing going on right now, I STILL love you Adam Lambert.Have been following you ever since American Idol. I wish you love, Happiness and your career is going great! Thank-You Carol as usual for the great videos of Adam. I appreciate your taking the time to do this site! Thanks for Sharing Carol – Love it. 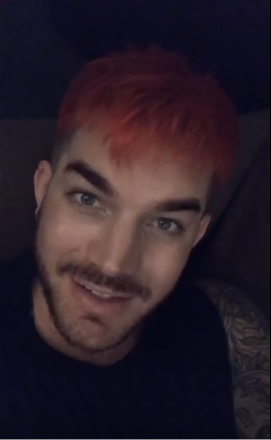 I enjoyed his live chat,,,not crazy about his red hair but no big deal….it will be different when he comes to Chicago on July 13. I cant wait….anyone planning to come to Chicago? We have extra tickets,,,,,we arent able to sell them online. Some folks backed out. Any ideas on how to sell them! I’ve had great luck on Ticketmaster Reseller & StubHub. Just price them lower than the comparable tickets. If not, take them with you & hawk them at the line outside the arena if you still have them. Good luck! I’m coming out to the Chicago show too! Also, try putting them on Twitter: @Adam_Tickets & my friend Cameron’s Chicago concert Facebook page – https://www.facebook.com/events/1761184780875751/?ti=cl. Thanks so much everyone. I guess now we can put them on Ticketmaster. At first they said no. I will take the best offer, but I can’t go too low. Can’t wait for Thursday. The reviews have been very good.